Go to the members area of the website of the AEDV, (https://aedv.es/backend/login) and login. 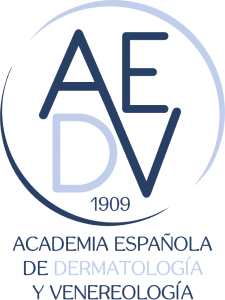 The Official publication of the Spanish Academy of Dermatology and Venereology (AEDV). Actas Dermo-Sifiliográficas, founded in 1909, is the oldest monthly medical journals published in Spain. In the year 2006 has been indexed in the Medlinedatabase, and has become a vehicle for expressing the most current Spanish medicine and modern. All articles are subjected to a rigorous process of revision in pairs, and careful editing for literary and scientific style. Together with the classic Original and Clinical Case Study sections, we also include Reviews, Case Diagnoses, and Book Reviews. Dermo-Sifiliográficas is an essential publication for anyone who needs to be current on all aspects of Spanish and world dermatology.